If once is an accident and twice a coincidence, traders looking for a third currency flash crash are surely poring over Japan’s holiday calendar by now, bracing for enemy action. Last week’s yen-driven crash that sent the Turkish lira into a tailspin and a sudden plunge in the South African rand in January 2016 had three things in common: they happened in the so-called early Asian witching hour, during an extended Japanese holiday and involved elevated long positions from retail investors in under pressure high-yielding currencies. With nine more extended holidays coming in 2019, taking account of weekends, speculators may be readying for a further attack on Japanese retail positions, should a similar opportunity arise, according to market participants. The next holiday up is Jan. 14. The problem, or opportunity if you’re a hedge fund, is the absence of Japanese participants on a holiday means the Australian market with a daily turnover of $32 billion is the main playing field for Asian trading until Singapore and Hong Kong open. That’s about the size of outstanding long positions held by Japanese retail investors at the end of November, according to the latest data from the nation’s Financial Futures Association, and only a mere fraction of the $5.1 trillion-a-day foreign-exchange market. Brokers offering trades on margin to those investors have to mark to market positions on a daily basis, even when the Japanese market is shut, and liquidate them if losses reach certain levels. Though individual firms evaluate positions at slightly different times, this typically happens around 7 a.m. Tokyo time, said Takuya Kanda, general manager at Gaitame.com Research Institute Ltd. The dearth of liquidity makes stretched retail positions vulnerable to a speculative attack, should some traders try to trigger stop losses, and profit from extreme moves. “Certainly when you’ve got those Japanese holidays and such big retail positions, the market will take out their stops,” said Nick Twidale, chief operating officer for the Australian unit of Tokyo-based Rakuten Securities Inc., a subsidiary of Japan’s e-commerce giant Rakuten Inc. While a forced rush for the exit on short yen positions can begin a move, it is the behavior of algorithmic trading entities, who might operate “kill switches” during periods of extreme volatility, which can greatly amplify swings, according to Ray Attrill, head of foreign-exchange strategy at National Australia Bank Ltd. in Sydney. Such funds can either move to the sidelines, or switch to trading in the direction of the initial move, he said. The flash crash early Jan 3., the last day of an extended Japanese holiday, saw the yen surge nearly 4 percent against the dollar in a span of minutes, the largest swing in the pair since the 2016 U.S. presidential election. 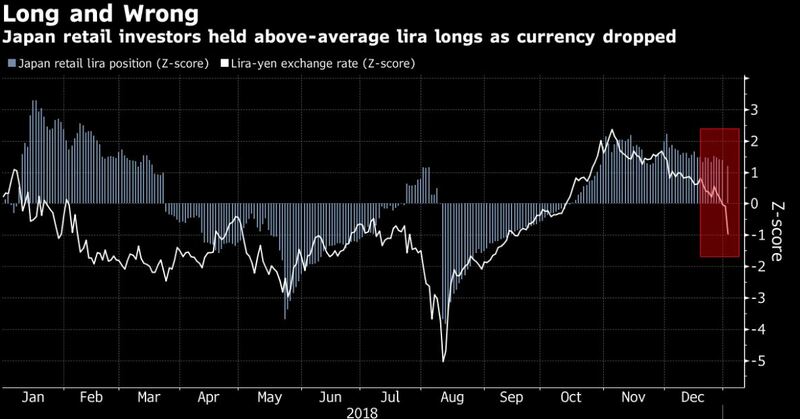 A flood of orders to sell Australia’s dollar and Turkey’s lira against the yen triggered the move, with the former falling as much as 7 percent and the latter 9 percent against their Japanese counterpart. 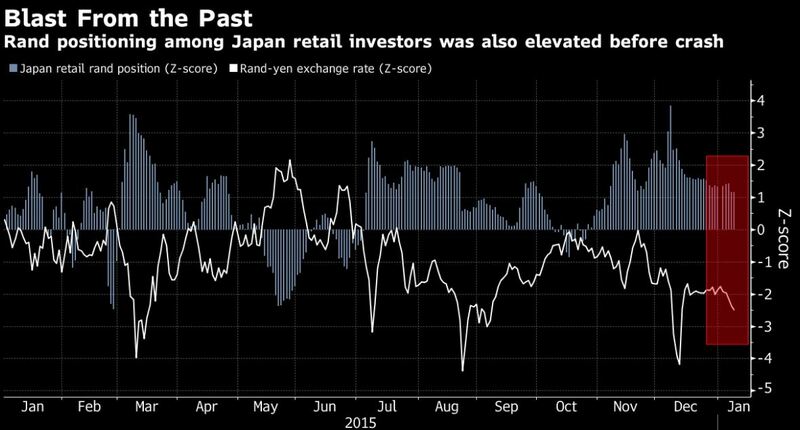 The vulnerability of Japanese retail accounts has come into renewed focus in the past year as emerging markets suffered from a dollar-inspired rout. The Bank of Japan’s negative interest rate policy coupled with its tight control over 10-year bonds has deprived savers of interest income and driven the country’s investors toward higher-yielding currencies. Alongside the Turkish lira, other high yielders where Japanese retail investors hold long positions include the South African rand and Mexican peso, while they are also invested in the Australian and New Zealand dollars, according to open interest data from the Tokyo Financial Exchange. Thanks to Japan’s “Happy Monday” policy, that moved some national holidays to the first working day of the week to stimulate tourism in 2000, there are nine more extended holidays in 2019, taking into account weekends. Traders nervous about the elevated risk of a flash crash don’t have too long to prepare – there is a holiday this weekend. Still, for fund managers like Kate Samranvedhya, deputy chief investment officer at Jamieson Coote Bonds Pty, such “liquidity gaps” are part of life.